Mic Check is especially suitable for courses in political science, government, economics, history, human rights, sociology, social justice and activism, and for campus event programming dedicated to social issues. The films were curated by Nick Shimkin, a film programmer and writer based in Brooklyn, NY. "This is what happens when you put digital technology in the hands of smart young people who have complete mastery over it -- high-level production values with grassroots content. I you want to know what the Occupy movement is all about, and what its 'demands' are, watch these films. They're clear evidence that we are witnessing not only a serious revolt against global inequality, but also a joyous revolution of the mind and imagination." "The Occupy movement is spectacular and unprecedented; there's never been anything like it that I can think of. If the bonds and associations that are being established at these remarkable events can be sustained, this could turn out to be a very significant moment in American history." "Confounding claims that US citizens would be resigned to capitalist crisis, then bailouts chiefly for corporate interests, and then austerity to pay for them, Occupy Wall Street proved a powerful partner to the general strikes and leftward shifts transforming Europe's politics. As the crisis deepens unevenly across global capitalism, so too do the rising movements for social change. Mic Check provides a well-crafted window into the first big US step in that rising." "As much by the movement as about it, Mic Check allows us to see the blossoming of a new social movement in the words and actions of its participants. It gets inside the movement in a way that the mainstream media never do to provide a powerful and uncompromising view of the lives and motivations of the thousands of people that have given life to the Occupy movement in its diverse forms. Never dry or staged, Mic Check calls for us in a very imminent human voice to examine our own role in the political, economic, and environmental crises of our age." "Mic Check is a soulful, cinematic adventure from inside the largest social movement in recent history." "Mic Check explores the nature and spectacular rise of the 'Occupy' movement, from a modest encampment at the foot of the Wall Street goliath to a global force for democracy and social justice. A provocative look at the trials, inter-workings, and roaring successes of one of the most important movements of our time, and the multitude of micro-movements it spawned. As vibrant, diverse, and momentous as the movement itself." "Mic Check, while capturing the excitement of the rise of the Occupy/Decolonize movement, moves beyond the encampments to highlight the movement's promise. Its emphasis on the ongoing battles around housing and foreclosures, education funding and food justice, debt and direct democracy, give it an importance that goes far beyond the actions it documents from the movement's first six months." "The significance of the Occupy movement has been subject to much discussion and debate. This collection is a fine addition to that dialogue. These short films allow us to re-visit the sense of excitement and possibility that many felt when Occupy exploded onto the scene. They provide bite-sized glimpses into different aspects of the movement: anti-eviction direct actions, mic checks at school boards, the inner-workings of the general assemblies, and much more. 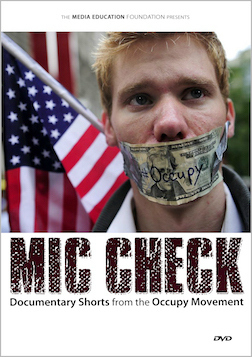 Mic Check stands out as one of the most compelling contributions on Occupy so far." "Mic Check takes us on a fascinating personal tour of the Occupy movement, helping us to see how grotesque economic and social inequality impacts each and every one of us. An arresting and powerful film for anyone hoping to better understand this crucially important political moment." "These short films show the occupations from the inside: the intensity and excitement on the ground, the confrontations with police, and the theme of economic injustice from those who feel it in their personal lives." "Mic Check is a fabulous gift and tool for our movements. Made by movement participants, capturing the voices of people in the movements as they simultaneously protest and create something new, based in a vision of a new world. This is a film to watch, share, watch again and celebrate -- as we celebrate the many new worlds in our hearts and under construction in the streets." "Mic Check beautifully captures the spirit of a unique historical moment, when people across the United States stood up and joined the global uprising against a profoundly unjust system. Together, the short segments offer a multidimensional view of what took place, showing the diversity of locations, people, issues, and ideas -- as well as the deep current of unity underlying our common struggle for a way of life that is democratic, fair, and sustainable." "Mic Check brings the viewer into the front lines of one of the most important social movements of our time, through the eyes of grassroots filmmakers."